Location within Pierre-De Saurel RCM. 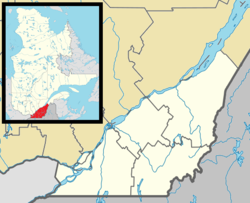 Massueville is a village municipality in Pierre-De Saurel Regional County Municipality, Quebec, Canada. The population as of the Canada 2011 Census was 516. It is named after Gaspard-Aimé Massue, landowner. Its sister municipality is Saint-Aimé. The town lies the banks of the Yamaska river. The core of the town is composed of several well kept heritage houses. 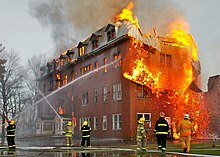 Massueville had a big fire near the church in an abandoned convent on 27 October 2006. ^ a b c "(Code 2453010) Census Profile". 2011 census. Statistics Canada. 2012. ^ "(Code 2453010) Community Profiles". 2006 census. Statistics Canada. 2007.